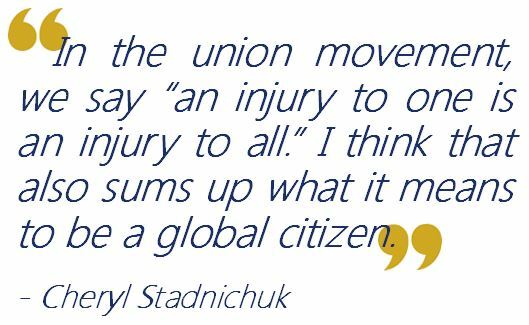 CHERYL: Global Citizenship means taking responsibility for how our actions, and the actions of our governments and corporations, impact others. A global citizen supports universal human rights that supersede the arbitrary laws and actions of governments. But there are also collective rights that we must uphold: free, prior and informed consent of indigenous peoples here and around the world is fundamental. Freedom of association is critical. JOANNE: To me a global citizen is someone who recognizes the interconnections that exist between peoples, countries and ecologies worldwide, someone who is willing to stand in solidarity with people working for social and environmental justice here at home and worldwide. NEST SASKATOON: We, the members of Nest, are part of the worldwide human family and are interconnected, one with another. We need to treat each other with respect, viewing encounters with people from different cultures as opportunities to learn and broaden our understanding of the world and its peoples. We are privileged people and have a responsibility to reach out to those who aren’t as blessed/fortunate as we are. RHONDA: I think I would start with the idea of “think globally, act locally”. To me this means understanding my connection to the humans and other lives on this planet in a respectful way. It means nurturing relationships across many differences to create respectful, engaging communities. KYLA: Global citizenship means contributing the best of oneself to the world. A global citizen honours the diversity present in our world while simultaneously recognizing what connects us all. RHONDA: I think our greatest challenge is coming to terms with the exploitation involved in past and on-going colonialism, and its impacts on people and the non-human world; I believe it is the root cause of environmental and social justice issues. I see promise in the relationships built locally and globally, often online, in the growing understanding of injustices, such as residential schools, and conversations about values, the United Nations Declaration on the Rights of Indigenous Peoples (UNDRIP), etc. CHERYL: There are many, but I want to focus on the unprecedented growth in income inequality. The obscene accumulation of wealth into the hands of the few is creating more poverty and precarious work and undermining our democracies. We need to have bold tax reform and reverse decades of declining government tax revenues. There need to be more regulations on international finance and implementation of the Tobin tax to raise revenues from international financial transactions. KYLA: Disconnection, internal and external. Even though we think our technology makes us more connected, on a deeper level, many people feel lonely, isolated, and forgotten. The solution is for people to look both inward and outward for deep and authentic connection. JOANNE: I have found the work of Joanna Macy and the concept of “The Great Turning” very useful in looking at solutions. She sees our time as being in transition and in need of three equally important areas of work. These include: “holding actions” which are actions that reduce the destruction; the creation of structural alternatives, and; a shift in consciousness. We need all these types of actions. One person cannot do them all, nor should they try. Each of us will be drawn to types of action, and they are all important. 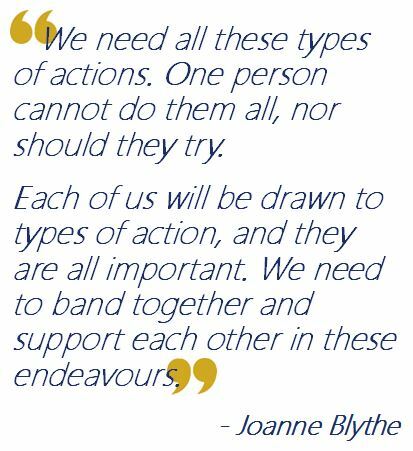 We need to band together and support each other in these endeavours. 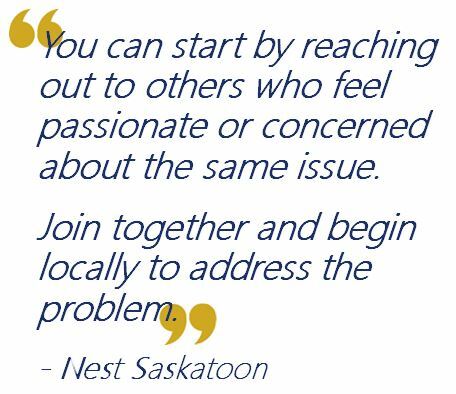 NEST SASKATOON: There are many complex issues in our world and one can feel overwhelmed and hopeless, questioning what one person can do. One can begin by reaching out to others who feel passionate/concerned about the same issue as you do, join together and begin locally to address the problem. KYLA: Inspiration is everywhere if we are willing to see it. Look at a flower, listen to a child, receive a kind word – inspiration is there. My students and children are a constant source of joy and inspiration that teach me fresh ways to perceive things. RHONDA – I currently find great inspiration in the resilience, resistance, strength, courage and honesty of Indigenous women. Many have given me hope for a future where we can live in reciprocal relationships with healthy land, and in a society that has genuinely addressed colonialism and is no longer perpetuating it. CHERYL: I am inspired by women in the global south: women who are challenging sexual violence and femicide in India and other countries; women like Sandra Ramos in Nicaragua who fights for the fundamental labour rights of women working in the maquilas; indigenous women in Guatemala, Honduras and Canada who take on Canadian resource companies who are contaminating their lands and water; and women human rights defenders like Berenice Celeita in Colombia who tirelessly advocates for vulnerable populations even in the face of death threats. The strength and conviction of these women amazes me and inspires me to stand up for human and labour rights. JOANNE: I draw inspiration from three sources. From nature – I am continually amazed by nature’s resilience, despite being undermined at many a turn, to rejuvenate and come back to life. It feels at times that the rest of nature is waiting for us humans to come back to our senses, to work with instead of exploiting nature, and that when we do, life and healing will spring forth. From the people we work with on the Maternal Health Project in Mozambique – their resilience, determination to build a better world for their people and their joy in living is an inspiration to me. And from literature and art, particularly one of my favourite authors, Ursula K Leguin – her commitment to her craft, her ability to explore “what if”, her integrity, and her understanding of the power of words and real stories to change the world. Tell us about a teacher, mentor, or other role-model in your life. JOANNE: My fourth-grade teacher, Vera Dorosh, was 21 years-old when she came to our school for only one year. She had a way about her that engaged children that made us feel valued, like we belonged. When my friend Theresa and I wanted to play baseball with the boys at recess (we usually played softball) and the boys didn’t want us to, Miss Dorosh stood up for us and said, “They can play.” And we did. I learned a lot from her –that I was smart and “a good little thinker” as she said; that I could be trusted to do responsible things, and; that girls could do things, even when the guys were threatened. To a young girl, these ideas were profound. KYLA: Mark Anderson, my high school English teacher, taught me to ask questions and believe in my abilities. Heather Salloum, my cooperating teacher during internship, helped me see that it is better to be accused of caring too much about students than not enough. Janice Huber, my thesis advisor, encouraged me to deeply listen to others, especially those whose narratives are different from my own. And Joyce Vandall, my long-term colleague and friend, showed me to continually advocate for my students and see each student as precious, worthy, and capable. CHERYL: My grade eleven social studies teacher at Viscount Central High, Mrs. Johnstone, sparked my interest in social and world issues, and encouraged me to explore topics such as indigenous issues and world politics. Other mentors and role models inspired me to understand the world more critically, such as my political science professor Joe Roberts, who taught me class analysis. My friend Cathy Ellis became a central driving force in Tools for Peace at the same time as I got involved. Cathy taught me about solidarity and social justice, and brought passion, humour and imagination to our Tools for Peace meetings, our educational work across the province and our long packing sessions of tools for Nicaragua. What do you see as one of the most encouraging or innovative trends creating positive change in our world? 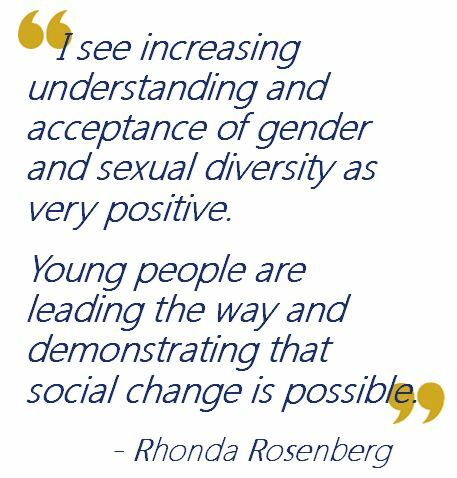 RHONDA: I see increasing understanding and acceptance of gender and sexual diversity as very positive. Young people are leading the way and demonstrating that social change is possible. CHERYL: There is an exciting resurgence of women around the world mobilizing for their rights and creating change. For example, the broad movement of indigenous women and allies in Canada demanded an inquiry into Missing and Murdered Indigenous Women and Girls, and the government established one (however imperfect it may be). Women around the world organized massive marches to protest misogyny and the attacks on women’s equality; after tens of thousands of women in Iceland went on national strike to demand equal pay, the government passed equal pay legislation. Our main challenge is to ensure that women’s mobilizing does not exclude racialized, indigenous and marginalized women. KYLA: Mindfulness. For many years we have tried to solve the world’s problems by looking outward, but mindfulness teaches us to shift inward. 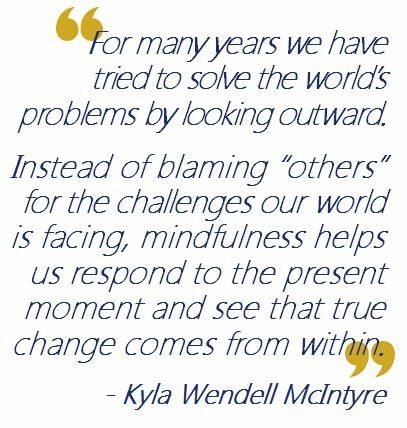 Instead of blaming “others” for the challenges our world is facing, mindfulness helps people respond to the present moment and see that true change comes from within. Mindfulness supports people to be more compassionate and see our inter-being, just what a global society needs. JOANNE: Young people getting involved in all sorts of social change – environmental, economic and social justice at home and internationally. They are smart, articulate and committed to action. What is one way that you, as one person, can work for sustainable solutions to global challenges? JOANNE: The work I do in my job with the Maternal Health Project is a wonderful example of partnership and solidarity, as well as equality and power – empowering women. In my volunteer time I concentrate on ecological resilience through my work with Permaculture Saskatchewan, which is all about designing ways of living and meeting human needs while regenerating and enhancing the environment. KYLA: In my work I focus on dignity and human rights; our world is divided because we don’t really know each other. We make assumptions about what other cultures, races, religions, abilities, and people are like. Even though many classrooms contain a lot of diversity, students are not always given an opportunity to dialogue and understand this diversity. Through teaching students mindfulness and giving them meaningful opportunities to create personal connections with each other, students become more authentically informed, compassionate, and accepting of difference. I believe this ripples into students’ families, communities, and ultimately – our world. RHONDA: One of the ways I work through partnership and solidarity is our BRIDGES program which, on a provincial and local level, brings together newcomers, Indigenous people and the organizations that serve them. The program is a partnership between three different organizations, and creates opportunities for organizations and community members to learn about each other’s cultures, histories and current realities. 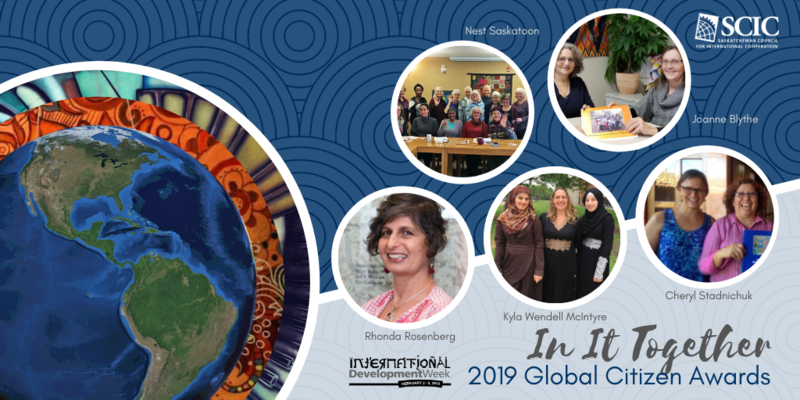 These intercultural connections can help build alliances for communities that benefit all. CHERYL: As a researcher for a public sector union, I’ve had the privilege to work on many campaigns to support public services and fight privatization. In 2015, I visited a community-union water treatment plant in Colombia supported by CUPE where the municipal workers’ union had recently won their fight against privatization. Now, they provide technical support for the plant and 100 families have access to affordable, clean, safe water in their homes instead of having to haul water from great distances. It is a beautiful example of union-to-union solidarity and a lesson that we learn more from our partners in the global south than what they learn from us.